Are housing costs taking up a big chunk of your budget? You’re not alone. Whether they rent or own their homes, housing affordability is a challenge for millions of households. But it’s especially a problem for households that rent. Nationwide, renter households are more than twice as likely to be housing cost burdened as owner households. Want to learn more about your mortgage payments? Check out our mortgage calculator. Harvard’s Joint Center for Housing Studies found that 27% of renters are severely housing cost burdened. The 11.8 million renter households who pay 50% or more of income on rent is projected to increase 11% by 2025. What exactly does “severely housing cost-burdened” mean? What Does It Mean to Be Housing Cost Burdened? Housing cost burden relates to housing costs as a share of income. The government standard for a “housing cost-burdened” household is one where 30% or more of household income goes to housing costs. To be “severely housing cost-burdened” a household must spend 50% or more of its income on housing costs. Why does it matter? Households that are severely housing cost burdened have been shown to cut costs in other areas, spending less on food and healthcare. This reduced spending impairs the household’s quality of life and is a drag on the overall economy. Severely housing cost-burdened households are also at a greater risk of losing their housing altogether, moving in with relatives or depending on their cities’ shelters and other homeless services. Some households that are housing cost burdened judging by the percentage they spend on housing have enough residual income to meet their needs. But in general, housing cost burden – and particularly severe housing cost burden – is considered a reliable proxy for precarious household finances. SmartAsset looked at Census Bureau data to find the cities where the highest and lowest proportion of residents were spending 50% or more of their income on housing costs. Our study examined housing costs as a percentage of income in 167 cities. We added the number of households spending 50% or more of their income on housing costs across eight income brackets. Those brackets range from households earning $10,000 or less per year to those earning more than $150,000 per year. We divided the total number of households spending 50% or more on housing by the total number of households in each of the 167 cities. Next, we ranked each of the 167 cities according to the percent of households spending 50% or more on housing – that is, the percent of households that are severely housing cost burdened. Check out the full methodology below. Cities in coastal states have high housing cost burdens. You may have heard that many of America’s coastal states are thriving centers of economic activity, contributing an outsize amount to the country’s GDP. Well, big cities in these states are facing upward pressure on housing costs, leading to a high percentage of severely housing cost-burdened households. The West and Midwest are less housing cost burdened. 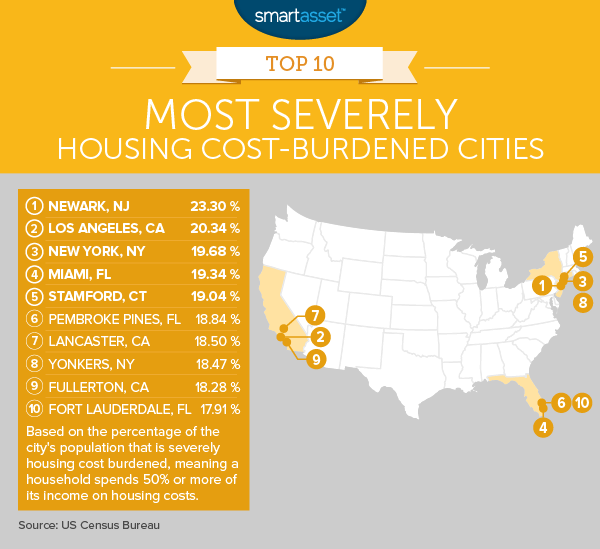 Not a single city on our list of the 10 least severely housing cost-burdened cities is in the Northeast, and only one (Cary, North Carolina) is on the East Coast. Of the cities we examined, those in the Midwest and West tended to have less severely housing cost-burdened households. No city is perfect. Even Sioux Falls, South Dakota, the least severely housing cost-burdened city in our study is facing cost burdens. Though only 4% of households across all incomes are spending 50% or more of their income on housing costs, 10% are spending 30-50% of household income on housing costs. Those households are still housing cost burdened, though not “severely” so. 20.3% of LA households spend 50% or more of their income on housing costs. Considering that a fifth of the city is severely housing cost burdened, it’s no wonder that Los Angeles was also on our list of the cities with the lowest real minimum wage. 19.7% of Big Apple residents are severely housing cost burdened. 17.7% pay between 30 and 50% of their income in housing costs. In New York, the supply of housing, particularly affordable housing, hasn’t been keeping up with the influx of new residents. All that upward pressure on prices is leaving residents with severe housing cost burdens. Miami was hit hard by the housing crisis and hasn’t fully recovered. 19.3% of Miami city residents are severely housing cost burdened, and 19.8% spend 30 to 50% of their income on housing costs. Median household income in Miami is lower than the nation’s overall median income. 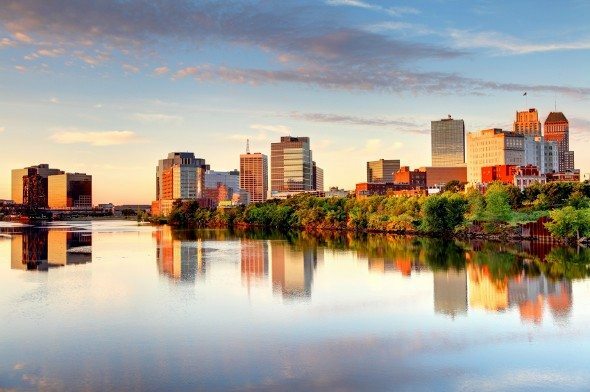 Many people have a vision of wealth when they think of the state of Connecticut. However, not all Connecticut residents are financially secure. 19% of Stamford residents are severely housing cost burdened, and 17% spend 30 to 50% of their income on housing costs. Stamford also made the list on our SmartAsset study of the cities with the lowest real minimum wage. Located about 30 minutes north of Miami, Pembroke Pines is the eleventh most populous city in the Sunshine State. Its population grew 6.9% between 2010 and 2015. 18.8% of Pembroke Pines residents are severely housing cost burdened. 19.5% spend 30 to 50% of household income on housing costs. According to the Census Bureau, the median rent in Pembroke Pines between 2010 and 2014 was $1,411. In recent years, Pembroke Pines has focused on developing affordable housing for the city’s senior population. Los Angeles County’s Economic Development Corporation gave Lancaster its ‘Most Business Friendly City’ Award twice in the last ten years. But with a poverty rate of 22.7%, it’s easy to see why so many Lancaster residents are severely housing cost burdened – 18.5% to be exact. 20.2% pay between 30% and 50% of their income in housing costs. Also, 16.9% of residents under 65 are uninsured, a rate that’s higher than the national average. If you read the book or watched the HBO miniseries Show Me a Hero you’ll know that housing is a contentious issue in Yonkers. The poverty rate in Yonkers is 15.9% and 18.47% of households are severely housing cost burdened. 19.9% of residents are paying 30 to 50% of their income toward housing costs. 18.3% of Fullerton households are severely housing cost burdened (paying 50% of their income or more on housing costs), and 20.5% are paying 30 to 50% of their income in housing costs. With its poverty rate of 17.3%, Fullerton is one Orange County city that doesn’t fit the glitzy stereotype. Fort Lauderdale may be known as a party city, but beneath the lighthearted image is a serious struggle to find affordable housing. 17.9% of households are severely housing cost burdened and 16% spend 30 to 50% of household income on housing costs. 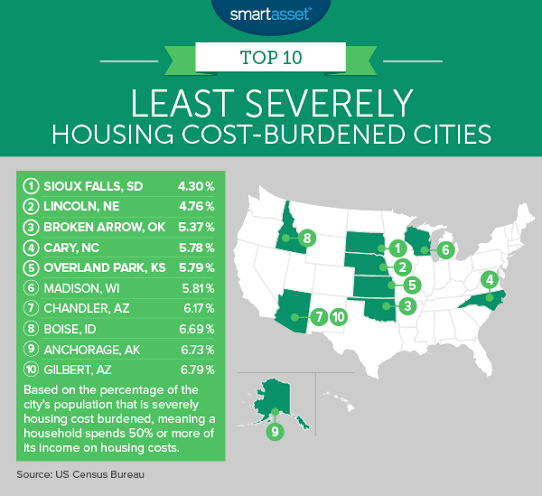 Sioux Falls isn’t just one of the best cities for children (according to a previous SmartAsset analysis), it’s also the least severely housing cost burdened city in our study. Just 4.3% of Sioux Falls households are paying 50% or more of their income toward housing costs. Still, 10% are spending 30 to 50% of household income on housing costs. Another honoree on our SmartAsset study of the best cities for children, Lincoln, Nebraska is a relatively affordable place to live. In Lincoln, Nebraska, only 4.8% of households are severely housing cost burdened and 10% are spending 30-50% of household income on housing costs. The median rent in Lincoln averaged $727 between 2010 and 2014. Just 5.4% of Broken Arrow households are severely housing cost burdened, with 12% paying between 30 and 50% of household income toward housing costs. The poverty rate in this Tulsa suburb is 7.8%, and the city boasts a home ownership rate of over 77%. That’s about 13% higher than the U.S. as a whole. Cary, North Carolina is making a name for itself as both a booming tech hub and a great place to live. It has appeared on several SmartAsset lists, including the Safest Cities in America, the Best Cities for Motorcycle Owners and Where Are Millennials Buying Houses? 5.78% of Cary residents are severely housing cost burdened, and 10.3% pay between 30 and 50% of their income in housing costs. Overland Park is a well-to-do suburb of Kansas City. But while in nearby Kansas City 10% of households are severely housing cost burdened and 17% spend 30 to 50% of household income on housing, in Overland Park, only 5.8% are severely cost burdened and 11% spend between 30 and 50% of their income on housing. Only 5.8% of Madison households are severely housing cost burdened. However, 18% are spending 30 to 50% of household income on housing costs. That’s a higher proportion of housing cost-burdened households than in the other cities in this top 10 list. 6.2% of Chandler households are severely housing cost burdened, and 10% spend 30 to 50% of their income on housing. Chandler also has a poverty rate of under 10%. No wonder the city made the top 10 in our study of the Best Places to Get Out of Debt. The city of Boise is known for its diversified economy, with a mix of education, healthcare, technology, government, timber, farming and ranching all represented. 6.7% of Boise residents are severely housing cost burdened, while 12% spend between 30 and 50% of household income on housing. However, the poverty rate in Boise is slightly above the national average, at 15.2%. In beautiful Anchorage, Alaska (this author’s hometown) 6.4% of households are severely housing cost burdened. However, the match-up between incomes and housing costs isn’t perfect. 15% of Anchorage households are spending 30 to 50% of their income on housing costs. What’s more, the state’s recent budget crisis has led to massive outward migration. In Gilbert, 6.8% of households are severely housing cost burdened. 11% spend between 30 and 50% of their income on housing. Gilbert is also one of the nation’s fastest-growing cities. That’s no accident. The city has an internationally recognized Office of Economic Development that’s focused on bringing jobs to Gilbert. To find the most and least severely housing cost-burdened cities, SmartAsset used Census Bureau data for 167 cities from 2014. The data reported the number of households in each of eight income brackets paying less than 20%, 20-24.9%, 25-29.9%, 30-34.9%, 35-39.9%, 40-49.9% and 50% or more of household income on housing costs. The data set also listed the number of households in each city. To find the most severely housing cost-burdened cities, we calculated the percentage of households paying 50% or more of household income on housing for each of the 167 cities. For each city we added the number of households paying 50% or more on housing in each of the eight income brackets and divided the total number of severely housing cost-burdened households by the total number of households in the city. We then ranked the 167 cities based on the percentage of households that are severely housing cost burdened. The top 10 and bottom 10 from that severely housing cost-burdened ranking made up the two charts above. We also calculated the percentage of households that were housing cost burdened (though this did not affect the ranking for this study). For each city we added the number of households in each of the eight income brackets paying 30-34.9%, 35-39.9% and 40-49.9% of household income on housing. We then divided that number by the total number of households to get the percentage of households that were paying 30-50% of household income on housing.